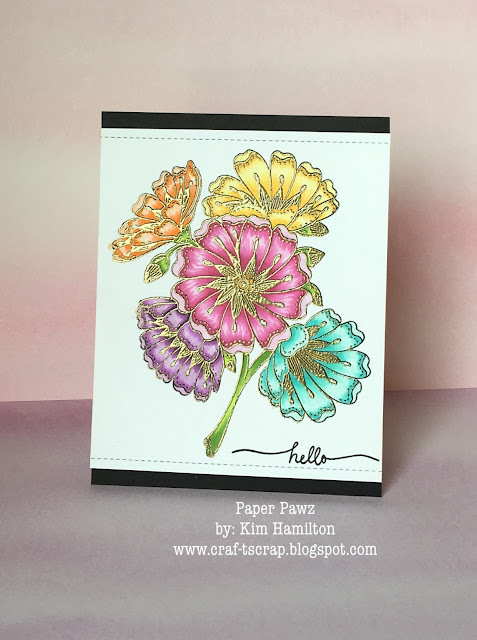 Paper Pawz: Sunday with new Penny Black! Sunday with new Penny Black! I had a nice quiet craft room kind of weekend! It was way too cold to bother with going outside except for taking the dogs! I had time to play with some new goodies including another new Penny Black stamp. I just love this new release, the flowers are simply lovely. This cluster is a Slapstick Cling called Burst of Blooms. I originally stamped the image in MFT Black Hybrid Ink to use my Copic markers. Once I finished my colouring I went back (thanks to my Misiti!) and stamped it with Versafine and used gold embossing powder. I just love the way it turned out, so much that I wanted a very simple sentiment. The "hello" is by Mama Elephant and the dotted border die is by Lawn Fawn. Once I finished the focal panel, I felt little strips of black on the top and bottom would be just the right final touch! Thanks for stopping by have a great Sunday! hello! this is gorgeous, your coloring is fabulous! I am so glad you played along with us at simon says stamp wednesday challenge! CFC170 - No Dies Allowed! Simon Says Stamp Flickr Challenge - Think Spring! Birthday selfies for a friend!